Recently, one of my students, Tyler gave me some fifty year old sourdough starter. Yes, fifty years old and rocking strong. We had about 12 ounces and we promptly named him "50 cent" after the rapper. Tyler had been working at Chef Phillip Lee's restaurant "Scratch" on La Cienaga in Los Angeles. "50 cent" had been brought to the kitchen by one of the sous-chefs, Ryan. 50 cent had been in Ryan's family for fifty years. He looked and smelled great. He is the George Clooney of starters. When he arrived 50 cent was more bubbly and strong then my beloved starter, Sofia. Great care had been taken of him over the years. I was very impressed and delighted. A new family member - Sofia's long lost grandfather. I began feeding him 50% filtered water and 50% Harvest King Bread flours I was instructed. At home, I use Gold Medal, Better for Bread to feed my starters and for my bread baking. The other important thing I did was to bring a portion of 50 cent home - just in case something would happen to the refrigeration at work and I would lose him. I have some Sofia at home as well. I keep them both strong and healthy - it's important to always have a back up when you are working with sourdough at work. Yesterday I made my first baguettes with 50 cent. They turned out great. The recipe is inspired by the River Cottage Bread Book. The dough is very sticky but it needs to be for a good open crumb. It can also be overnight fermented in the refrigerator to develop more flavor. 1. Combine water, yeast and starter in the mixer bowl. 2. Add flour and salt. 3. With the dough hook on speed 2 mix the dough for 4 minutes until it clears the side of the bowl. It may stick to the sides and the bottom of the bowl - resist the urge to add extra flour. 4. Remove the dough from the bowl and stretch and fold a few times to smooth the dough. 5. Place the dough in a bowl, cover, and let rest for 45 minutes. 6. After 45 minutes, stretch and fold again. Repeat this process 3 more times. 7. Let the dough rest 10 minutes after the final fold and divide in half. 8. Shape into logs and let rest for 10 minutes, covered. **They were covered right after I took the photo. 9. Shape into baguettes, place on a parchment lined floured sheetpan or in an oiled baguette tray. 10. Preheat the oven to 425 degrees. 11. Place the baguettes in the proofing bag with a mug of steaming water. 12. 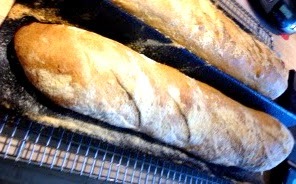 Let proof until the baguettes have risen about 1/3 and have a marshmallow texture. The baguettes are proofed when you gently squeeze the sides of the baguette and you finger indentation does not spring back. 13. Dust the baguettes with flour, slash the baguettes (5 slashes are typical) and lightly spray the surface with water. 14. Place the baguettes in the hot oven and spray the oven door with a light mist of water. 15. Check at 25 minutes. The baguettes should be golden brown and feel light when you pick them up. Use a towel or a oven mitt as they are hot. They will probably need a 5-7 minutes more baking time. If the baguettes are getting too dark, turn the oven temperature down 25 degrees.